If you know me, you’ll know I never miss a chance to escape abroad. But in spring and summer my own home country, The Netherlands, is actually a lovely place to be. 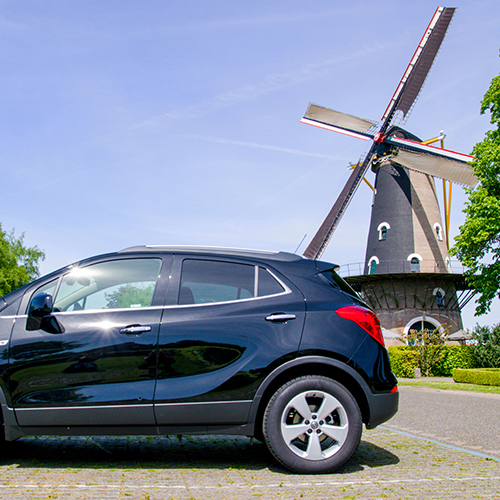 During three beautifully sunny days Hertz challenged me to explore The Netherlands during a Delicious Drive, in search of lesser known bites & drinks. The itinerary was up to me. During the first of my three days with Herz I decided to return to my roots: Noord-Brabant. Having a rental car to use was a huge benefit on my mission, as it allowed me to get to places you normally can’t reach without a car, or it would take forever to get to with public transport. 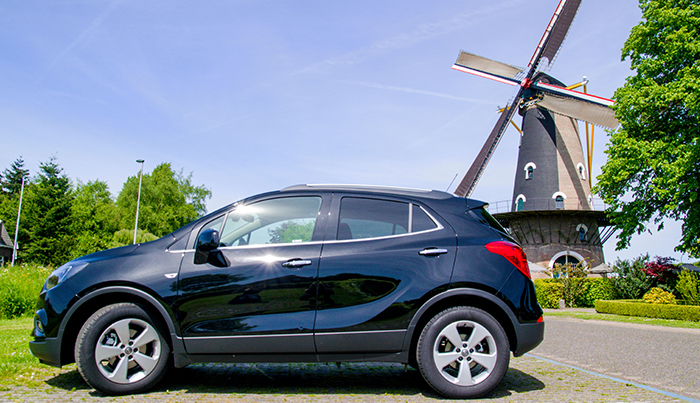 Once I arrived at the Hertz car rental location in Utrecht I saw the big shiny Opel Mokka Turbo that was going to be my travel partner for the next three days. I’d never driven a new car like this, so it was really a revelation of luxuries: the start-stop system, automatic lights, a satnav system, a rearview camera, the opportunity to sign along to my own Spotify list … and even wifi! It made my drive with Hertz comfortable and easy. On to stop number one: Den Bosch! If you’re talking about true Dutch specialties a Brabant native like me will instantly tell you about the Bossche Bol. This pastry is a giant profiterole, filled with cream and coated with chocolate. 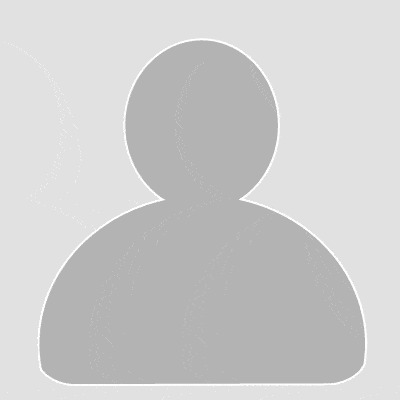 I went in search of the best one, and I found it at Banketbakkerij Jan de Groot. This isn’t just any confectionary, this is the shop that belongs to the granddaughter of the inventor of the Bossche Bol! He invented the sinful treat in 1938. The confectionary is now THE place to go to for the pastries, having grown large due to word of mouth advertising. It supplies Bossche Bollen to many other cafes in the city. Having eaten a handful in my life I never counted myself as a fan of the Bossche Bol: too heavy, too intense. But it turns out I’d just never had a good one. 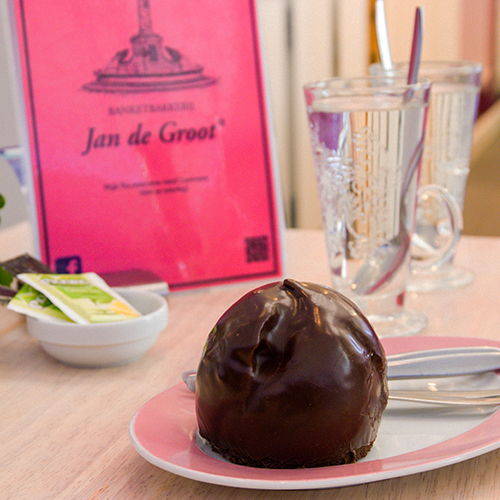 The Bossche Bol from Jan de Groot is light, crispy, with a sweet cream filling and thin chocolate coating. Not too heavy, the exact right balance. As I sat down on a Monday morning to enjoy my pastry, the place was already bustling with locals enjoying their morning coffee and pastry. 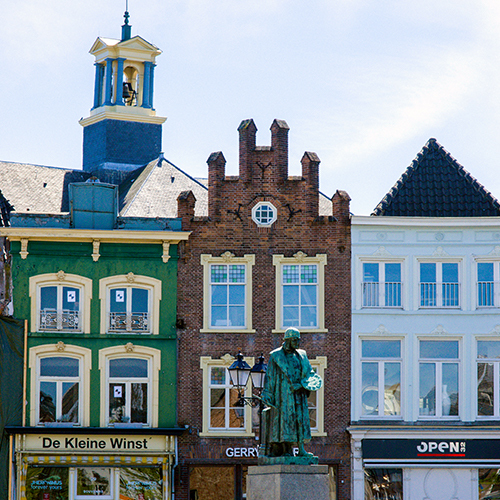 Once you’re done with your sugary treat, it’s time to burn off some of that energy with a walk through Den Bosch, one of my favourite Dutch cities. I spend lots of time in the city, so I know my way around. There’s a fun, easy-going atmosphere in this medieval city, which was home to renowned painter Hieronymus Bosch. My favourite parts of the city are the old city center, the beautiful Binnendieze canals and the glorious Sint Jans cathedral. My favourite thing about having a rental car is the freedom to change your schedule and jump at any opportunity that comes your way. I was planning on going to the small town of Boxtel for lunch, but a friend recommended Oisterwijk, so that’s where I ended up going instead. Such a cute town! 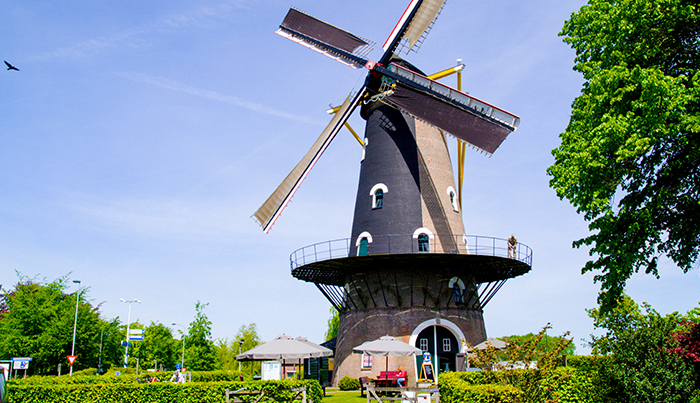 The best part was where I drove past a windmill, and spotted they served food and drinks. I decided to stop there, park the car, and head in for lunch. 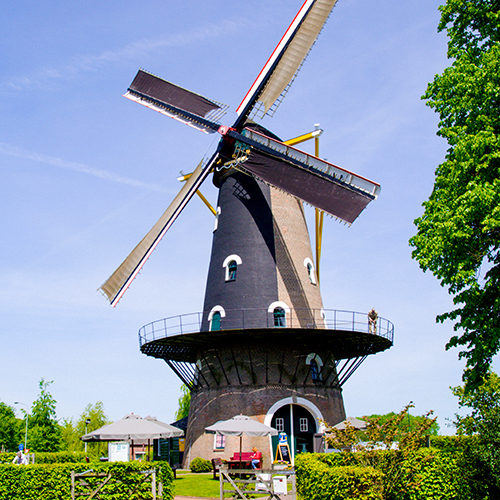 The Kerkhovense Molen was built in 1895 and is still in use. Inside you find the cutest little shop that sells local products, that also functions as a small café. When the weather is good, you can sit outside and enjoy your food and drinks in the sunshine. I opted for a Brabantse Worstenbroodje, which is a local’s favourite: a sausage-filled roll, and ate it while enjoying some of the rare sunshine. I was a little short on time to visit Oisterwijk itself, but it is an adorable little town. One of the windmills visitors, approached me in true Brabantse style (friendly and open), and proudly told me about the towns history. He told me Oisterwijk has always been a prosperous town due to its location on the trade route between Nijmegen and Belgium (most notably Antwerp). Aside from the town center, the churches are worth a visit. The Sint-Petrus’-Bandenkerk is a neo-gothical basilica from 1897, and the pride of the town. It was designed by Pierre Cuypers, a famous Dutch architect, responsible for the designs of Rijksmuseum and the Central Trainstation in Amsterdam. Then it was time to check in for our brewery tour at La Trappe in Berkel Enschot. I’m not a beer drinker, but my travel companion was, and as it happens I have a huge love for products with an original story. As I have lived in nearby Tilburg for years, I was beyond excited to get to visit the La Trappe Brewery. We sat down in the Proeflokaal (tasting room) at two o’clock, where we were shown an instruction video on the history of the abbey and the beer, before we got to visit the actual brewery itself. The complete tour takes 1.5 hour and includes a La Trappe beer. La Trappe beer is produced on the Abbey Koningshoeve. 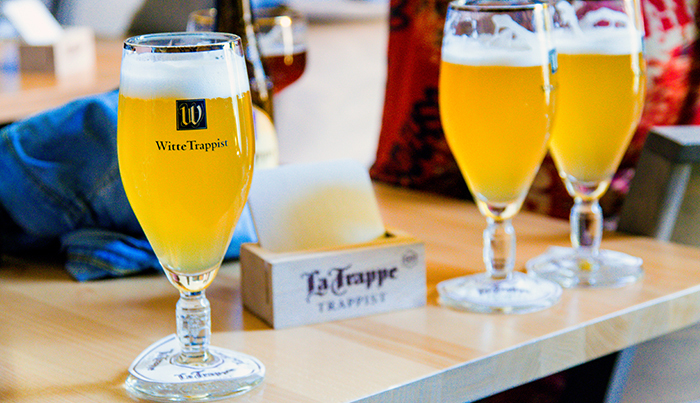 La Trappe is a craft beer that’s produced by monks. To fall into the category of Trappist beer, the beer must abide by three rules: the beer must be produced inside the walls of an abbey, the beer must be made by or under the supervision of monks, and the abbey must do charity work. There are 22 monks living in the abbey (which cannot be visited), who support themselves according to Benedictine teachings, by producing cheese, bread and beer. The beauty of this place is that the abbey could not exist without the brewery, and the brewery could not exist without the abbey. Because of the growing attention for craft beer, the brewery has seen its production double in the last four years. 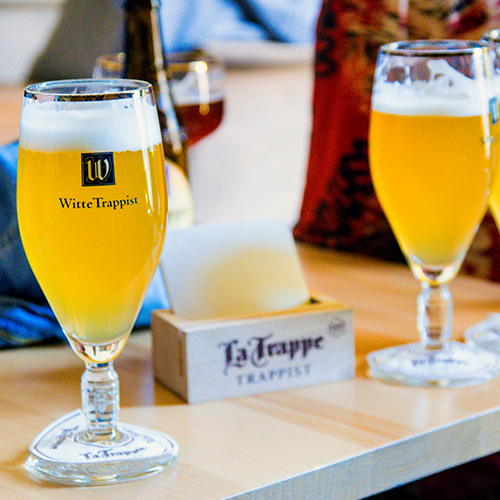 La Trappe takes great pride in producing locally, with great attention to nature. If you’re not interested in the brewery tour, it’s also possible to go to Proeflokaal for locally produced food (and a La Trappe beer, obviously – when in Rome…). Time to round up the day in my birth place: Breda. A city that’s often overlooked by tourists, while it is one of the most beautiful and relaxed cities in the Netherlands (in my humble and not at all biased opinion). Just check out De Grote Kerk, one of the most impressive structures in the city. The Brabant’s Basilica was constructed in 1547 and is open for visitors. I have been inside multiple times (I’ve even climbed it), and on one of those occasions saw King Willem Alexander in the church (he was still crown prince back then). It wasn’t too strange for him to be there, as the Basilica’s Prince Chapel is a mausoleum for the forefathers of the Dutch Royal family. The church is the face of the church. Due to its height, it can be spotted from afar. It is also widely considered to be one of the most beautiful churches in the Netherlands. 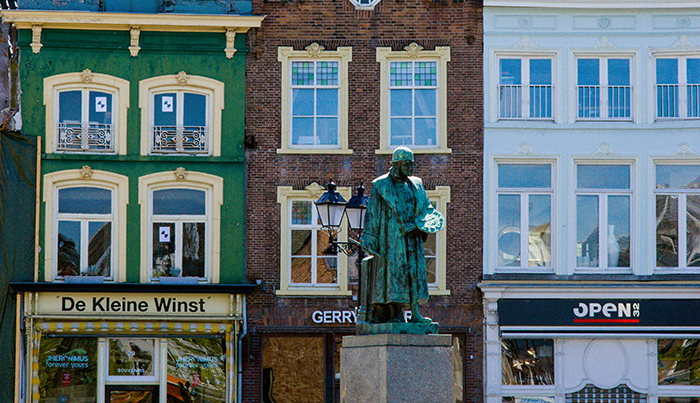 Its position on the Grote Markt means you can look at it while enjoying a drink. Because that is the place where locals gather on sunny days and at the end of a work day to have drink. We ended up having our drink and snacks at Café Vulling, a traditional Dutch brown café. Enjoying the real Burgundian style of life, this area of the Netherlands is known for. A moment later we sat down for dinner at Restaurant Zeezicht. The name stands for sea view, but that’s slightly confusing, as there is no sea in the near area. The view of the Grote Markt however, doesn’t disappoint. I had a great fish stew, and enjoyed the unrivaled atmosphere Breda. It was an absolute blast to have an opportunity to explore Noord-Brabant for Hertz which I really consider my home. It’s surely inspired me to explore more in The Netherlands. Stay tuned because the next two days I’ll be visiting other Dutch destinations in collaboration with Hertz. What is your favourite Brabant specialty?